Frederic Church carefully designed Olana’s 250 acres with an artist’s eye to his property’s 360-degree “borrowed” views of neighboring hills, valleys, the Hudson River and distant mountains. The views beyond Olana – its “viewshed” – were an essential part of Church’s original composition. The Olana Viewshed was Church’s muse, and in the 21st century it remains a vital part of Olana’s integrity as a complete work of art. Over the last few decades, a collaborative effort among preservation organizations, governmental divisions and private landowners has resulted in the protection of important views from Olana. In recent years, The Olana Partnership has begun to include the integral viewshed into its interpretation of Church’s design and Olana’s larger preservation story. The Groundswell 2013 event received a Museum Association of New York (MANY) award. Groundswell was a groundbreaking exhibition event featuring site-specific works in performance, sound, text, installation, and movement. A 19th century news account about Olana and its immediate region remarked on the extensive views from Church’s property: “From the Green mountains in the northeast, to the south, past Mt. Everett in Massachusetts, and smaller peaks in Connecticut, around to the Catskills on the west, is a grand sweep of country.” Church acquired and developed a private landscape which afforded views of regional natural wonders – mountain ranges, neighboring landforms (such as Mount Merino, Blue Hill and Becraft Mountain), ravines, the Hudson River Valley, and – significantly – a bird’s eye view of weather patterns, atmospheric conditions and the singular Hudson Valley sunrises and sunsets which inspired him and all the Hudson River School artists. Church designed and sculpted his personal landscape to be the foreground to this vast and theatrical backdrop. Olana also provides views of some man-made elements. From Ridge Road, one can view the City of Hudson, as well as the church steeples of the neighboring Village of Catskill across the river. In the distance, atop the Catskill Escarpment (also known as the Great Wall of Manitou), Church and his guests could see the Catskill Mountain House, America’s great wilderness hotel. This white wooden structure with its thirteen Corinthian columns would have caught the morning light and reminded Church of where he and his teacher Thomas Cole painted. After years of neglect, the Catskill Mountain House was intentionally burned down in 1963, but the rock ledge upon which it stood is still visible in winter months. On clear days, one can also see the cut up the Catskills which was the route for an early funicular railway to transport intrepid guests up to the hotel. The Olana Viewshed is astonishingly intact, and this is due to a broad collective effort, largely through the use of conservation easements. In most cases, private landowners have willingly agreed to protect large portions of their property in order to minimize future visual intrusions within view of Olana’s designed historic landscape.This is made possible by the work of a wide array of partnering organizations, such as Scenic Hudson, CL Conservatory, Open Space Institute, Trust for Public Land, Audubon New York and The Olana Partnership. In some cases, this is done in cooperation with New York State. To date, nearly 3,000 acres have been strategically protected within Olana’s historic viewshed. 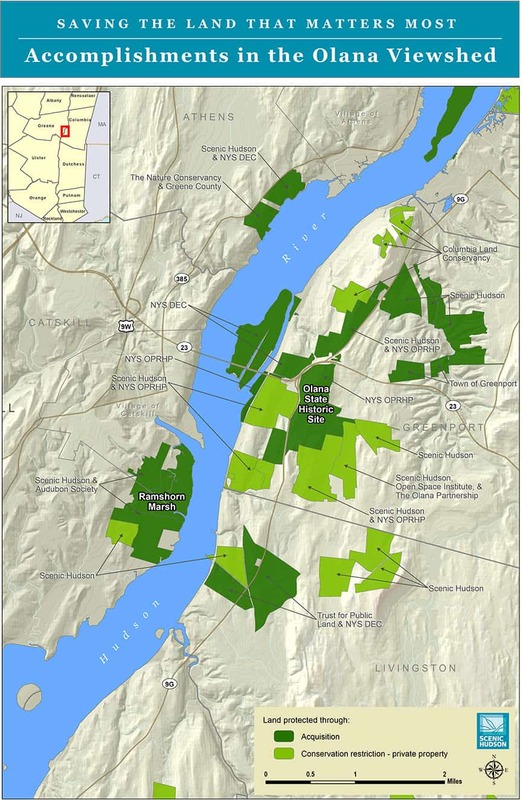 These protected land parcels span both sides of the Hudson River, and many have regional benefits as well as scenic value. For example, the Ramshorn-Livingston Sanctuary on the Hudson River protects wildlife, and since it floods twice daily due to the tide fluctuations, its 436 acres comprises the largest tidal marsh in the northern Hudson Valley. The 320 Livingston State Forest is historic land which was protected in 2008 and is directly south of Olana. Several protected parcels north of Olana are also in the watershed of Hudson’s South Bay and help maintain the quality of public water supply. In addition, several parcels that have been protected in the Olana Viewshed are working farms, and this has helped to maintain some of the agricultural character which would have existed in Frederic Church’s day. Mapping by J. Winner, 2013, courtesy of Scenic Hudson. This map documents the success of the collective effort to date to preserve views from and of Olana that were made famous by Frederic E. Church in his landscape paintings and in three-dimensional form at Olana. Since Olana was saved from destruction in 1966, additional efforts have been necessary to preserve the integrity of Olana as a whole. This often requires advocacy work, negotiations and legal action by groups such as The Olana Partnership and others, so that the best interests of Olana State Historic Site and its surrounding community can be served. In 1977, the Nuclear Regulatory Commission and the Power Authority of the State of New York held hearings on siting a massive nuclear power plant along the Hudson River directly in Olana’s main view. The plant’s smoke plume would have occasionally obscured views of the Catskill Mountains from Olana. There was much local opposition, and during legal hearings, Olana’s views played a role; a winter scene painting by Frederic Church of the view in question served as evidence. The Nuclear Regulatory Commission ultimately recommended denial of a construction license for the proposed nuclear power plant. This was the first and only time that such a recommendation had been made on any grounds—let alone environmental or aesthetic. In 1999, The Olana Partnership and other organizations raised concerns about the construction of a large industrial power plant across the Hudson River from Olana. The Athens Generating Plant was ultimately built, but significant mitigation efforts were implemented, including a reduction in smokestack height to preserve the ridgeline view, the use of natural building material colors, and the a decision to use dry (vs. wet) cooling in order to minimize the smoke plume effect. During the same period, St. Lawrence Cement announced plans for a 2.2 million ton coal-fired cement plant in Hudson and Greenport, New York. The towering smokestack would have been fully visible from Olana’s Ridge Road, the farm complex and other sites on Olana’s 250 acres. Frederic Church’s sketches of Becraft Mountain depicted part of the proposed site. In 2001, Riverkeeper and a broad environmental coalition, including The Olana Partnership, petitioned for consulting party status in a Department of Environmental Conservation permit hearing for the proposed project. In 2005, after severe protest from the Hudson Valley community and environmentalists, St. Lawrence Cement abandoned the Greenport project. Cosy Cottage and Church’s first painting studio faced Blue Hill, a distinctive landform located less than two miles southeast of Olana. Church’s sketches of Blue Hill are included in the collections of Olana and the Cooper-Hewitt in New York City. In recent years, Blue Hill’s ridgeline has been threatened with a proposal to expand an existing communications tower operation. Despite concerns voiced by The Olana Partnership, New York State and Scenic Hudson, the Town of Livingston approved the expansion in 2013. The Olana Partnership and Scenic Hudson have taken legal action to make sure that Olana, a National Historic Landmark, is fully considered in the tower’s placement and design. These groups also anticipate a federal Section 106 Review, which is an integral component of the National Historic Preservation Act (NHPA) of 1966. Since 2008, The Olana Partnership has been developing a landscape series which focuses on the Olana Viewshed. The goal has been to create diverse and original programming which also serves as an educational tool for interpretation and preservation at Olana. The Olana Partnership’s first two “Viewshed Tours” (in 2008 and 2009) explored private landscapes within Olana’s viewshed – with views back toward Olana. In 2011, The Olana Partnership launched the first in its “Framing the Viewshed” series, a symposium called “Framing the Viewshed: The Transformative Power of Art and Landscape in the Hudson Valley” which brought together diverse experts and went on to win a national American Association for State and Local History (AASLH) award. 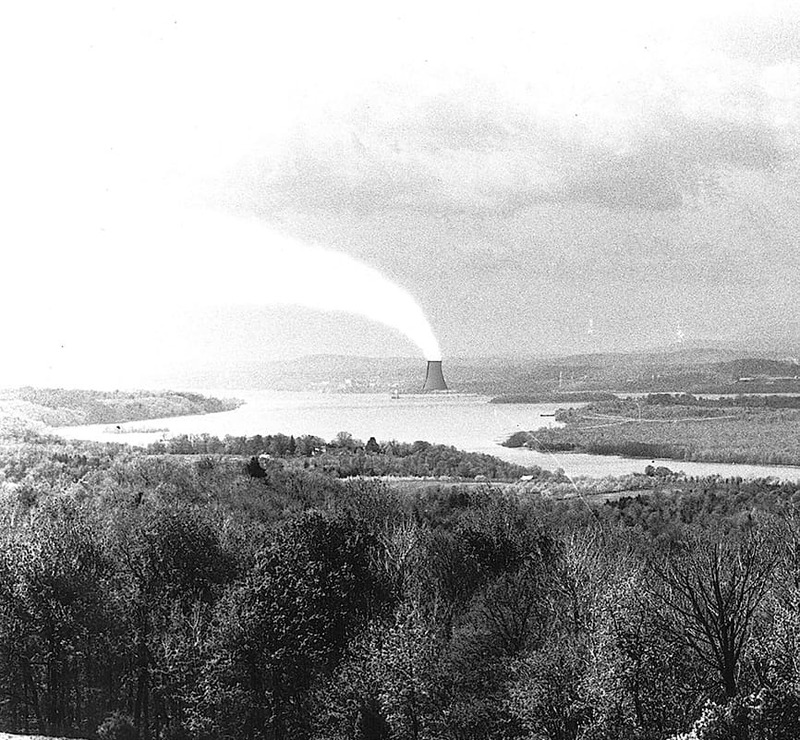 The second in the series was a panel discussion in 2012 called “Framing the Viewshed: A Bend in the River” which focused on Olana’s nuclear power plant episode in the 1970s-see key moments. In 2013, “Framing the Viewshed: Groundswell” was a one-day exhibition featuring site-specific works in performance, sound, text, installation and movement. 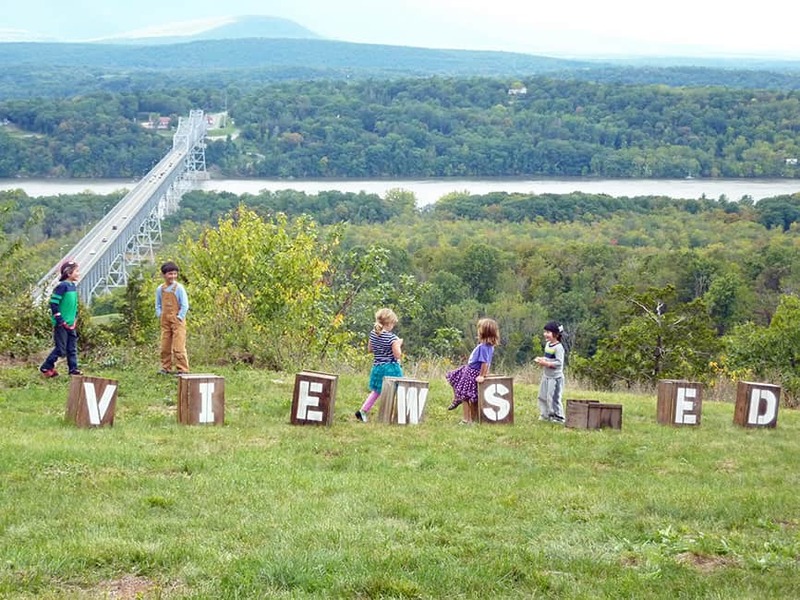 This viewshed-themed exhibition introduced a new generation of artists and audience members into a broader preservation-themed conversation at Olana.